Unicorn Healing® is a soul-based energy system that brings about health, wellness and empowerment, while providing clarity of your unique path, power and purpose. First created in 2009 directed from the Unicorn realms, this means of hands-on healing and self-discovery is continually evolving to meet the needs of humankind. It acts to bridge higher awareness and the raising of consciousness. What is involved in Unicorn Healing® treatment? Each treatment of Unicorn Healing® is as sacred as it is profound with sessions catered to the meet the intentions of the recipient. In each treatment, a trained practitioner connects to the Soul of the recipient and along with their Unicorn guides brings in Unicorn energy into where is best needed, be that on a physical or non-physical level. The practitioner brings in the Unicorn energy in a certain way that is taught throughout the course and may use other elemental and celestial frequencies to support the session too. Is Unicorn Healing® different to Reiki? Unicorn Healing® differs from Reiki as it comes from the celestial realms where the Unicorns reside and has a lighter, finer frequency that works from Soul level outward, to affect positive change. What are the benefits of a Unicorn Healing® treatment? The Unicorns believe that humankind never needs ‘healing’ as they appreciate we are perfect Divine beings at Soul level; yet they understand that living a physical life with free will can bring challenges and conditionings that separate us from our divinity, building up resistance and dis-ease in our being. And it is this conditioning that the Unicorns help us to shed when we are ready. In this way, receiving Unicorn Healing™ can help unblock whatever feels stuck in your life, whether that is within your relationships, finances, career, physical health, or provide greater clarity into your own path, power and purpose – an area that the Unicorns delight in helping with. Above all, the recipient will always receive a treatment as directed by their own Soul. What are the benefits from studying the Unicorn Healing® course? An aspect that all students of the course have shared is how much they have “found themselves” through the course; that they have awoken to who they are and have found courage to express themselves openly. Many have healed limiting conditions providing new inspiration, a greater sense of trust and the strength to follow their dreams. Others share that they have a greater sense of joy, playfulness, compassion and connection to their own Soul, spirit team and Mother Earth. If you are new to the Unicorns, would like to meet your personal guide and experience their loving presence, we recommend this gorgeous journey. 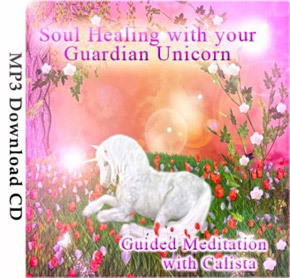 “I absolutely love this guided meditation to connect with your Unicorn. I have listened to this every night recently before going to sleep, it is deeply relaxing and comforting. I always feel very safe and loved when connecting with Unicorns. I highly recommend this guided meditation (as do I recommend all of Calista’s other ones too). Working with Unicorns brings so much Love and pure Light in to your Life! Love, Light, & Unicorn Blessings.” ~ Fiona, Scotland.